Gentle Jewelry Cleaner Solution | Gold, Silver, Fine & Fashion Jewelry Cleaning | Ammonia Free Clean | What Should I Say? Are you looking for a simple solution to clean your jewelry that isn't made from harsh chemicals? 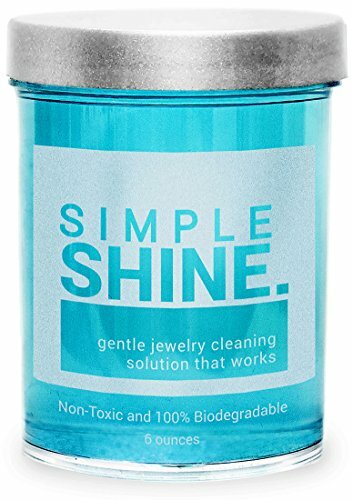 Forget the cheap, abrasive solutions and try Simple Shine Gentle jewelry cleaner today! This 100% NON-TOXIC and biodegradable formula works to clean years of build up tarnish or simple daily dirt. Our gentle cleaning solution works on gold, palladium, platinum, sterling silver, stainless steel, titanium, diamonds, CZ, pearls, beads, porous stones, soft stones, enamel, treated gemstones and more! One of the few cleaners safe for pearl, opal, emerald, turquoise, amber, coral and onyx. A favorite diamond ring cleaner and gold jewelry cleaner. The key difference between our product and cheaper solutions is that our cleaner works while still being SOCIALLY RESPONSIBLE and NON-TOXIC. See why others are calling us the best seller jewelry cleaner. Want to clean your jewelry and feel good about it? Try Simple Shine today and see why there is a difference! PREMIUM FORMULA, MADE IN THE USA.